At completion, trainees will have developed a complete Oil & Gas model using various supporting schedules. Trainees develop an Oil & Gas (O&G) financial model completely from scratch, inputting historical data as well as macro– and company-specific assumptions to project out financial statements using step-by-step instruction on selecting, locating, and developing appropriate projection drivers. At completion, trainees will have developed a comprehensive O&G model using various supporting schedules. Trainees build O&G models using Excel templates and the exact way they would on the job. 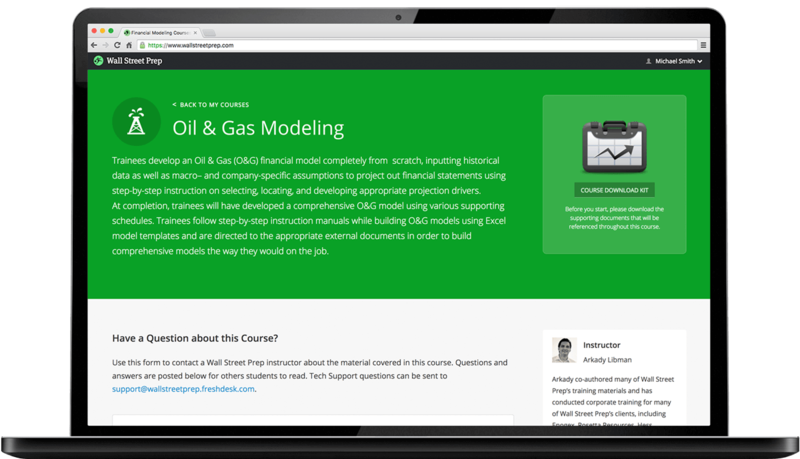 Wall Street Prep's Oil & Gas Modeling course is used at top financial institutions and business schools. Wall Street Prep's Oil & Gas Financial & Valuation Modeling Self Study Program is intuitive and self-paced. You should expect to spend approximately 100 hours to complete it. The program uses approximately 700 pages of tutorial guidance and Excel model templates to teach students how to build, analyze, and interpret Oil & Gas financial and valuation models in a step-by-step fashion, at their own pace. The Oil & Gas Financial & Valuation Modeling Self Study Program bridges the gap between academics and the real world to equip O&G finance and industry professionals with the practical financial skill set they need on the job. The program utilizes a case study format, as students follow their tutorial guide alongside the Excel model templates, and are directed to the appropriate external documents (SEC filings, research reports, etc.) in order to build complex O&G Financial & Valuation models the way they would on the job. Wall Street Prep provides its clients “lunch and learn” webinars on a variety of industry-specific and advanced topics that are of particular interest to investment banking, private equity and corporate finance professionals. As an Oil and Gas Modeling customer, you will gain access to all of these webinars, along with archived versions of past webinars. This course does not assume a prior background in Oil & Gas Modeling. However, those who enroll should have an introductory knowledge of accounting (e.g. interaction of balance sheet, cash flow, and income statement) and proficiency in Excel. 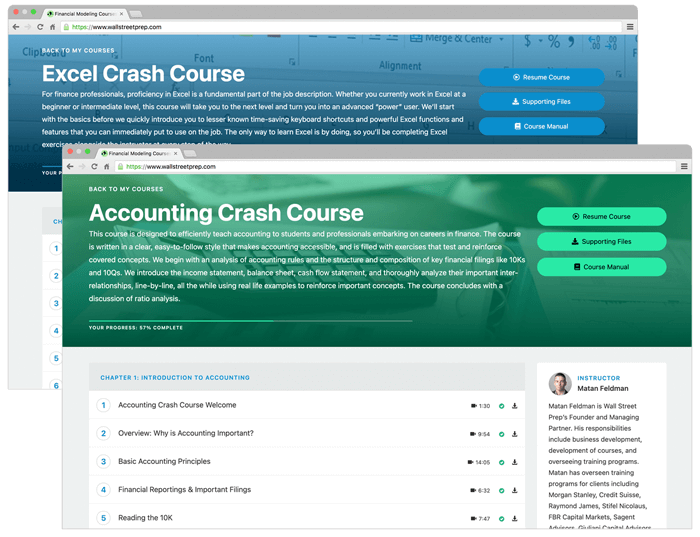 Students with no prior background in Accounting should enroll in the Accounting Crash Course. Students with limited experience using Excel should enroll in the Excel Crash Course. Building comprehensive O&G financial models from scratch the way it is done at major financial institutions. Participants will build an O&G merger model in Excel to reflect the pro forma impact of various acquisition scenarios. Topics covered include a quick test of accretion-dilution in all-stock deals, pricing structures (exchange ratios/collars/”walk-away” rights), purchase accounting, the step-by-step allocation of purchase price, and the derivation of important O&G metrics and ratios. I am a junior in college and enrolled in the Oil and Gas course to familiarize myself with this type of financial modeling. I am enjoying the accessibility of the material and how it's laid out in an easily readable format. I was trying to enter into IB with no previous financial modeling education and I wanted to learn how to actually build a financial model of an O&G company. Other IB professionals in my local CFA society took this course as well, so I signed up. The course is excellent. 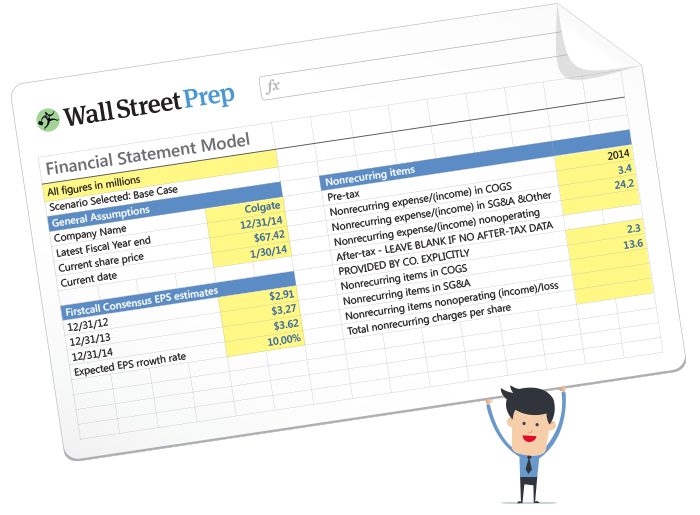 Wall Street Prep showed me how a model is actually built in Excel while the CFA was a good theoretical complement to some of the accounting choices done in the model. The books are elegantly presented and I will keep them at hand in my new job. I got hired as a FT IB analyst after completing my BSc and with no previous financial experience. This course + the CFA were an excellent combination which prepared me well for interviews!